As with its previous installment and predecessor – Rock Circus – this hit show features live music, aerial acts, funky dance routines and an electrical atmosphere that will rock you like no other. 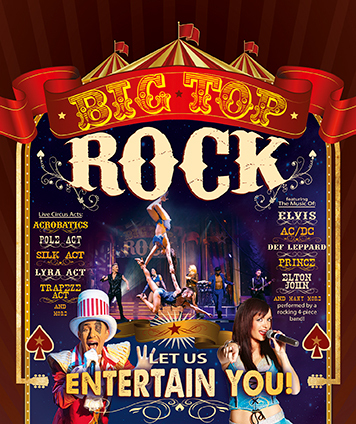 Big Top Rock will mesmerize and thrill young and old in an action packed show - featuring rock hits from six decades of music, bold acrobatics and slick choreography that will have audiences on the edge of their seats. Big Top Rock is the biggest, most entertaining and daring show ever produced by The Barnyard Theatres. So, welcome to the big top in the Barnyard - Let Us Entertain You!